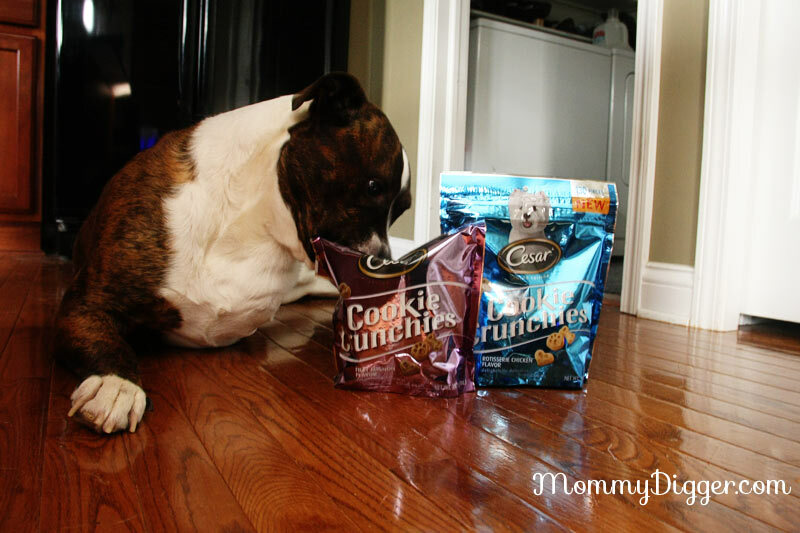 Our Pup Loves Cesar Cookie Crunchies Treats for Dogs! Our five year-old pit/lab mix Wheelz had a very rough start in life to a bum that intended to sell him as bait. He was born on the streets with only 3 legs and left to fight for himself for food. Thankfully, a wonderful rescue found him and took him in and once he was ready for a new home we were there to sign the papers. He has come a long way since than, he gets around so much better than he did and is such a loving, wonderful dog. It’s funny how excited he gets when we come home, even if we only stepped outside for a minute the moment you come back in you are greeted with a howl of excitement and kisses. He is also amazing with Baby Digger, the two are quite a pair and have so much fun together. She loves to use him as a pillow or chair and he’ll happily sit there and enjoy it even if shes bouncing up and down all over him. It makes us so happy to see our little girl and him have so much fun together and how patient he is with her. We all love him and love to show him by giving him special treats each day and our lucky dog just got the best dog treats from Cesar, Cesar Cookie Crunchies. Ceasar Cookie Crunchies come in two flavors, Rotisserie Chicken Flavor and Filet Mignon Flavor – flavors dogs are sure to love! Being that our dog has 3 legs, we have to be very careful to not let him get overweight so we have to really moderate treats. Ceasar Cookie Crunchies are only 10 calories each which means we are able to give him a few treats a day to show him how much we love him. They come in three bite-size shapes paw prints, hearts and a bone. I love that they are small in size because we can really make our pup feel spoiled. Plus, it makes them great for working with your dog on training as rewards. Ceasar Cookie Crunchies come highly recommended by Wheelz! I have never heard of these before. I love the small size too! first of all i LOVE your floors, secondly i will have to check these out, my pup is so picky with her treats.